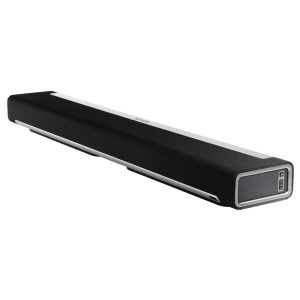 SONOS SUB: Takes your whole Sonos system one seismic step closer to the spine-curling jaw-dropping, full body experience music was meant to be. Filling any room with deep, bottomless sound you can feel with your whole body. – Fills any room with deep, clear HiFi bass. – Seamlessly integrates with the Sonos system. – Two force-cancelling speakers positioned face-to-face offer deep sound with zero cabinet buzz or rattle. – Place it anywhere in the room—even lying flat under a couch. 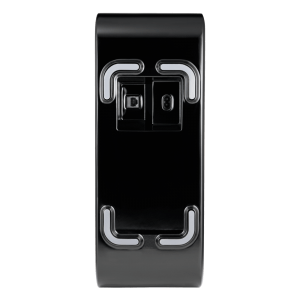 – Sleek, heart-pounding design in high-gloss black lacquer finish. 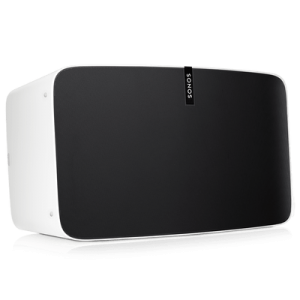 – Works with all Sonos amplified components: CONNECT:AMP/ZP120/ZP100; PLAY:5/ ZonePlayer S:5; PLAY:3. – Does not work with the non-amplified SONOS CONNECT/ZP90/ZP80. Introducing SONOS SUB: Soul-shaking sound. Heart-pounding design. One-button setup. 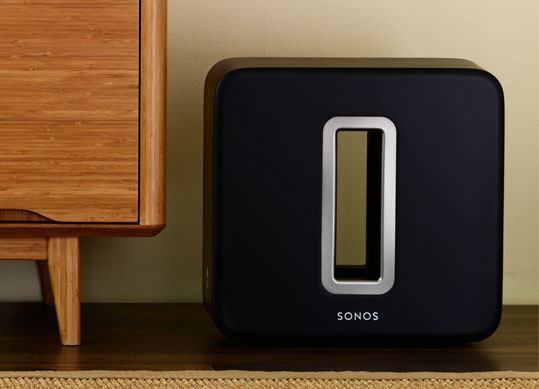 Take your Sonos system one seismic step closer to the soul-shaking, spine-curling experience music was meant to be. • All sound, zero vibration. Two force-cancelling speakers positioned face-to-face means all the sound and energy from the music comes through loud and clear, and none of it is lost in cabinet buzz or rattle. • One-button setup. No wiring. No programming. Press one button, follow the simple prompts on your Controller and the system automatically adjusts audio settings to perfectly balance your SUB and the paired Sonos component for a flawlessly optimized, whole-room listening experience. • Wherever you want it. Because it’s wireless and designed to perform perfectly, whether positioned horizontally or vertically, you can put the SUB anywhere you want in the room—even lying flat under a couch. • The SONOS System. Sonos lets you stream all the music on earth anywhere in your home. Start with one Sonos player then expand wirelessly, wherever you want your music. 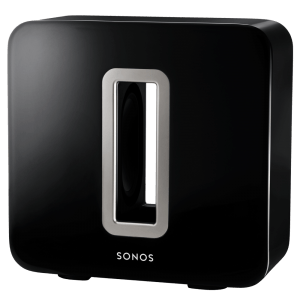 • The SUB works with all Sonos amplified components. CONNECT:AMP/ZP120/ZP100; PLAY:5/ZonePlayer S:5; PLAY:3. 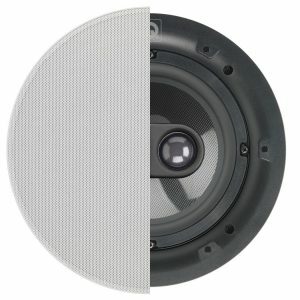 It does not work with the non-amplified SONOS CONNECT/ ZP90/ZP80. • AMPLIFIER Two Class-D digital amplifiers perfectly tuned to match the speakers and acoustic architecture. 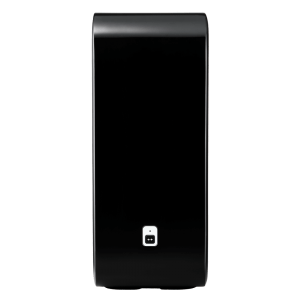 • SPEAKERS Two force-cancelling speakers positioned face-to-face for deeper, richer sound and zero cabinet buzz or rattle. • DUAL ACOUSTIC PORTS Carefully tuned to enhance the SUB performance. • FREQUENCY RESPONSE Plays down to 25 Hz. • ALL DIGITAL SOUND All filter settings, active equalization, and time alignment are done digitally through state-of-the-art DSP (Digital Signal Processing) circuitry for zero-loss audio quality and energy. • AUTOMATIC EQUALIZATION The system automatically adjusts audio settings to perfectly balance your SUB and the paired Sonos component to ensure amazing sound quality. • WIRELESS CONNECTIVITY SonosNet 2.0, a secure AES encrypted, peer-to-peer wireless mesh network. • ETHERNET PORT A single Ethernet port that can connect the SUB to a wired home network. 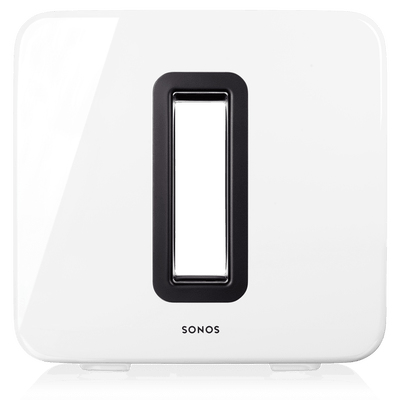 • PACKAGE CONTENTS SONOS SUB, AC Power Cord, Warranty and Regulatory Booklet, and Quick-Start Guide. • MULTIPLE ORIENTATIONS Stand upright or lay flat for flexible placement. • RUBBER AND FELT FEET Built-in rubber feet; optional felt feet included. 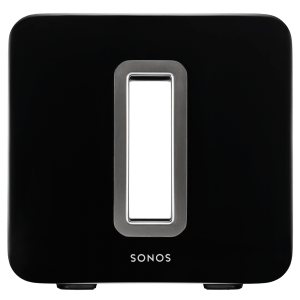 • SUPPORTED DEVICES SUB works with all Sonos amplified components: CONNECT:AMP/ZP120/ZP100; PLAY:5/ZonePlayer S:5; PLAY:3. Does not work with the non-amplified SONOS CONNECT/ ZP90/ZP80.